You’ve heard of the Humble Bundle sales, right? While its offerings are much more diverse now, the program started off a few years ago as a collection –a bundle, if you will– of indie games that you could buy as a package, paying whatever you want. You could pay a dollar or a hundred dollars, and the proceeds go to charity. 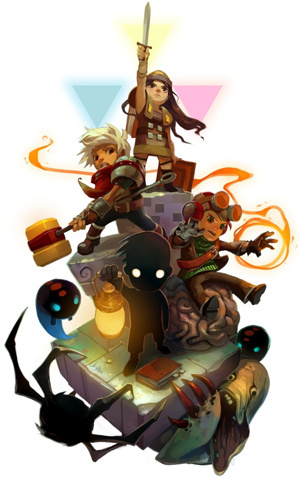 One bundle in 2012, for example, included Amnesia, Limbo, Psychonauts, Superbrothers: Sword & Sworcery EP, and Bastion1 The program has become a big success due to the appealing mixture of philanthropy and gimme gimme gimme. But while the pay-what-you-want and bundling concepts are great together, I think that a very simple psychological phenomenon often keeps people from spending as much as they might and thus getting as much money to charity. But I’ve got idea of how to fix that. First, though, let’s talk about dinnerware. Yaaaay! Dinnerware! You can see that Set A has everything Set B has, plus more. Sure, some of the items in that “more” are broken, but some are whole. Hsee then asked subjects how much they would pay for each set. The average amount was about what you’d expect: about $32 for Set A and $30 for Set B. People were willing to pay a little more for the additional, unbroken cups and saucers in Set A.
Unsurprising, I know. But here’s the thing: this was only one experimental condition –the “joint evaluation” condition where subjects looked at both Set A and Set B at the same time. Hsee had two additional groups of people in a “separate evaluation condition.” One group considered just Set A without ever seeing Set B, and the other did the same for Set B. When Hsee asked these people how much they’d pay for the dinnerware set they were shown, the pricing pattern flipped: people averaged a value of about $23 for Set A and $30 for Set B. That’s weird, right? People seeing a set with fewer pieces were willing to pay more than those seeing a set with more. WTF? Hsee explains this “less is more” phenomenon by saying that during separate evaluation mode, we value options –clothes, video games bundles, dinnerware sets– by comparing them to a reference point for that category. In the example above, the reference point is “a complete, 40-piece dinnerware set” –but only for Set A. Those looking at Set B have a different reference point: a complete, 24-piece set. We then tend to devalue options that compare unfavorably to that reference point. Set A compared unfavorably to the reference point of a 40-piece set because it had only 31 unbroken pieces. Set B’s comparison was neutral because it had 24 of the 24 pieces. 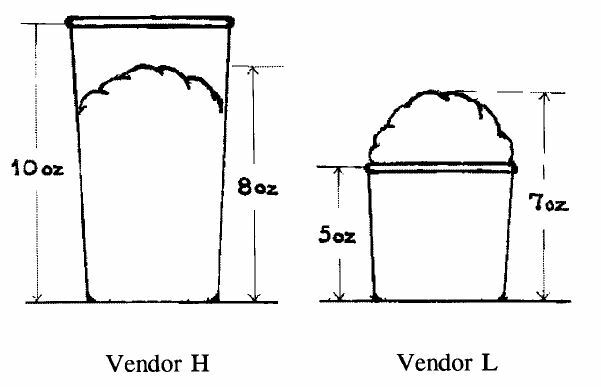 Hsee’s paper included another example that might make this clearer: a 10 ounce cup only partially filled with 8 ounces of ice cream was valued less than a 5 ounce cup overflowing with 7 ounces of ice cream. This despite the fact that the larger cup had more ice cream. Why? Because 8 ounces in a 10 ounce cup feels like someone is skimping. Lame. But 7 ounces in a 5 ounce cup? OH MY GOD THAT DUDE PILED IT UP LOOK AT MAH ICE CREEEEAAM! /dance. Like with Hsee’s subjects people considering the 40-piece dinnerware set with 9 broken pieces, I see a 5-piece game bundle with 2 games I already own.4 This “3 out of 5” comparison will drive down my valuation of the bundle. 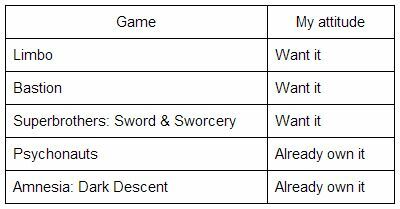 I might have even been willing to pay as much or more for just a 3-game bundle featuring just the titles I wanted! One possible solution to this would be to let Humble Bundle shoppers build their own bundles, humbly. A “Get any 5 of these 9 games for whatever you want to pay” offer might generate higher prices.5 Or encourage people who get their Humble Bundle purchases in the form of Steam keys to gift them or sell them individually if they already own or don’t want a game. That would at least add some value. Or maybe it could be as simple as letting users uncheck a box next to the name of individual games they already own or don’t want, so that those titles disappear from the screen, leaving only a set of unowned and desired games from which shoppers will form reference points. Similar packaging of deals on Steam or Origin might be smart to use data on what games shoppers already own and actually not display them during the sales pitch. It’s hard to believe that we’re that easily manipulated in such a counter-intuitive manner, but it’s often true. 1. Another feature of the Humble Bundles is that if you pay more than the current average, you get a bonus game –Bastion in this case– but let’s set that detail aside for now. 3. Though remember from the dinnerware example that this effect disappears when you directly compare two options. Then we value things more rationally. But in many shopping experiences –like the Humble Bundle for instance– that kind of opportunity doesn’t come up. 4. Alternatively, imagine that I didn’t own the games, but knew that I had no interest in playing them based on their reputation, genre, etc. That’s just as likely. 5. Though it’s also possible that people would latch onto the list of all 9 games as their reference point and end up devaluing the whole thing more. Someone should study that. My solution to these overflowing games I get in Humble Bundles and such, especially if I want only one or two, is to keep the keys to distribute to some less sale-savvy friends. So, after a while, I get to have birthday presents to almost all my gamer friends. Yup I agree. You can save the keys of games you already have for gifts later. I guess you could do that with the broken dinnerware pieces, too. Don’t try to “fix” what isn’t broke. The last 2 bundles I bought them just for soundtracks and 1 game I didn’t have, so… this article is completely wrong from my point of view. Sometimes you don’t know something is “broke” until a better way comes along and shows you how much better it is than the old way. The Humble Bundle in of itself is an example of this. A new way of paying for games, which ended up making developers and charity a lot of money. Which is why you give the one’s you already have away, and that acts as a form of advertising for the bundle site. I had to laugh at your bundle example–it’s actually the last bundle I bought because I didn’t own any of the games. That definitely colors my choices–in fact, colors it more than bundles that have games I simply don’t want. It seems easier to overlook a game I don’t want because it would still be new to me, than to pay for games I’ve already bought once. I would add this for the commenters–don’t be ignorant. The article is about trends, and the author is right. Your single anecdotal “this doesn’t apply to me” is basically meaningless in context. It’s economics 101. And gaming isn’t immune from it. One website, Groupees, has implemented the “Build a bundle” concept you describe, where buyers can exclude games they don’t want. The discount per game is slightly bigger, though, if more games are bought. They also do regular bundles, so it might be possible to compare their sales trends. Well Psychology as a whole cannot always be 100% accurate. This is an evaluation of an average. On average thats how a persons mind would work. Perhaps there are people that don’t fit into this thought pattern because guess what? not all people are the exact same. The whole article is flawed, based on the idea that most buyers pay more than the minimum. People were willing to buy that table set B after seeing it BECAUSE they saw it. It was more to their tastes. I’m cheap, and I buy bundles at their minimum price. I buy the second tier games if I like them, and I don’t if I don’t. I have no clue of sale statistics, but if I had to come with a number, I’d say 95% do exactly what I do. If set B isn’t more attractive then it’s not more, it’s less. Doesn’t the fact that you can gift duplicate/unwanted games mitigate this to some extent?